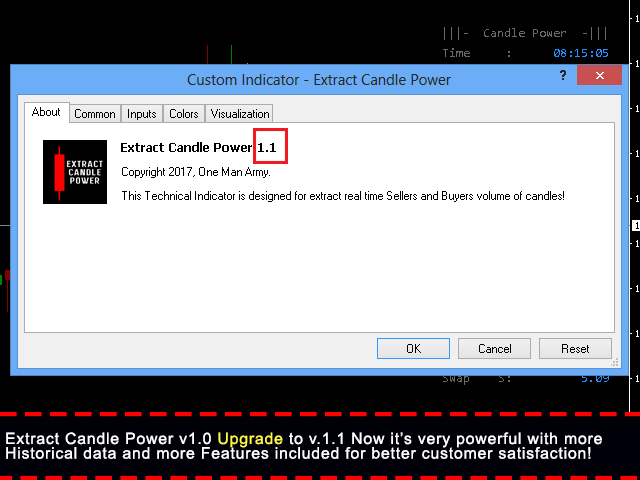 Extract Candle Power is the real time Sellers and Buyers volume extractor of the candle. As well as you can analyze few previous candles volume and able to decide the exact trend better than traditional Moving Average. 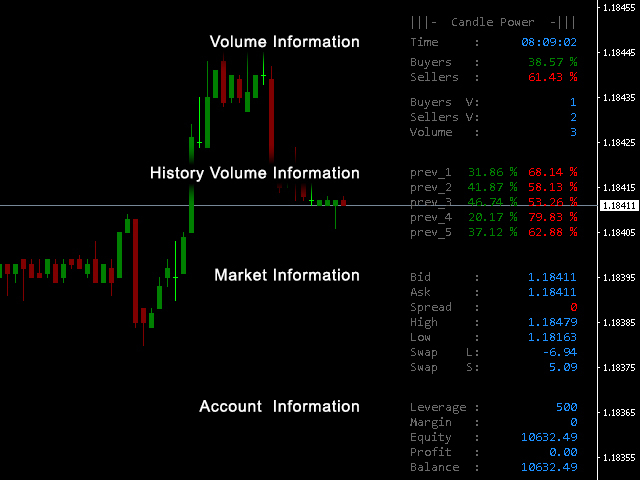 The extracted sellers and buyer volume is very useful to determine traders current position. 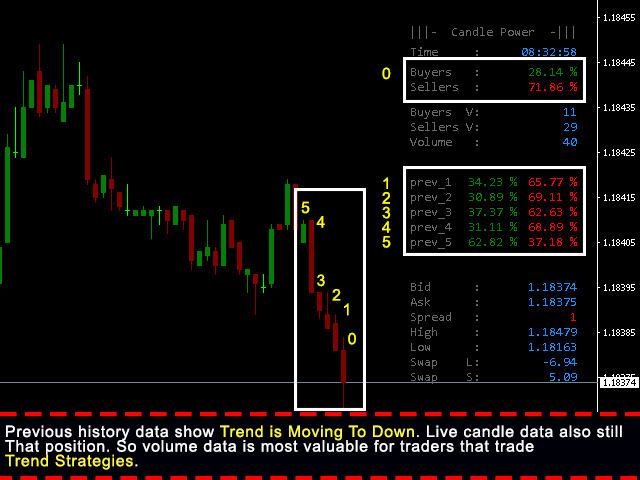 As well as you can compare the real situation of live candles with Moving Average to find reversal points. 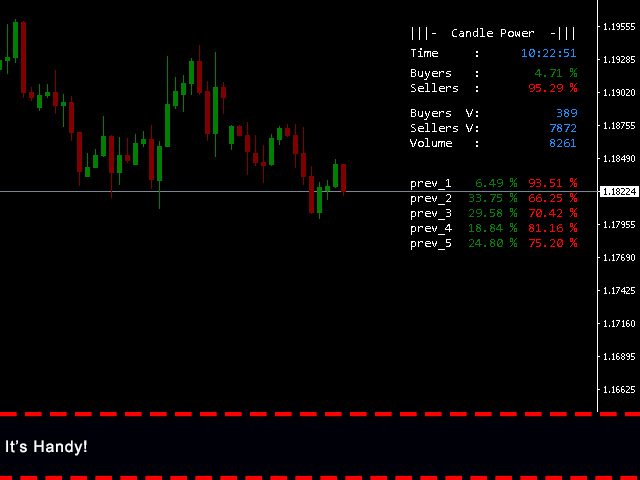 Extract Candle Power work with all time frames and highly accurate decision maker when using a higher time frame. 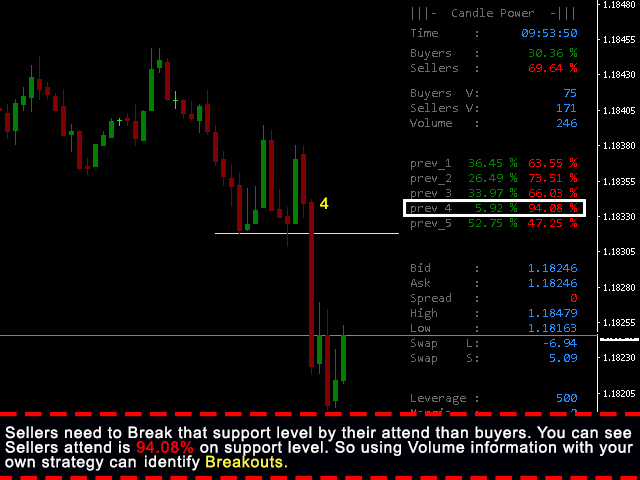 However, you can choose any time frame and any currency with your strategy. Buyers volume as percentage of volume. Sellers volume as percentage of volume. 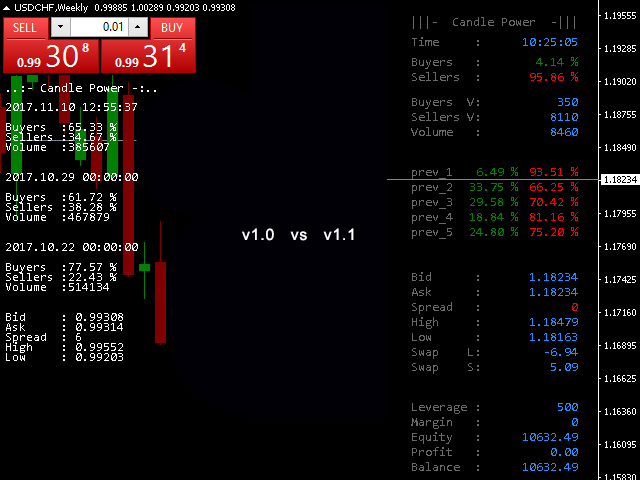 Buyers and Sellers volume percentage of few previous candles. Real spread of your broker. 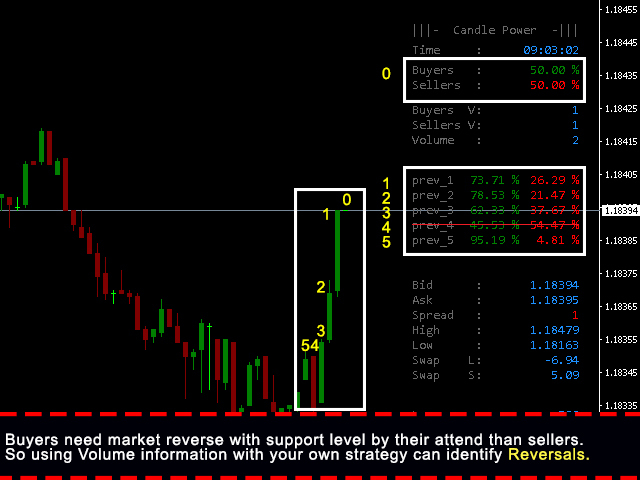 Buyers Color - Color of buyers volume percentage on high of candle. 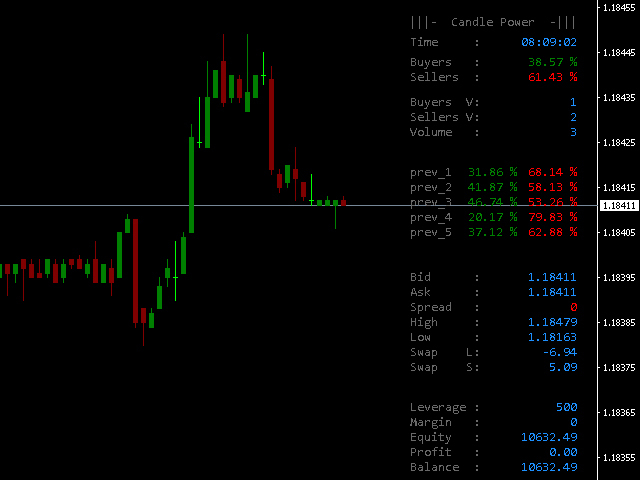 Sellers Color - Color of sellers volume percentage on low of candle. Label Color - Color of all labels on Information panel. Font - Font family for information panel. Font Size - Font size for information panel. Y Distance - Distance from top to bottom. Step - Step between lines. Volume Section Display - Activate/Deactivate. Buyers Volume Color - Color of buyers volume. Sellers Volume Color - Color of sellers volume. Total Volume Color - Color of total volume. Label X Distance - Distance from right to left for label. Data X Distance - Distance from right to left for total volume data. Sessions Section Display - Activate/Deactivate. Sydney Color - Color of Sydney. Tokyo Color - Color of Tokyo. London Color - Color of London. New York Color - Color of New York. Sessions Label X Distance - Distance from right to left for labels. Sessions Time X Distance - Distance from right to left for sessions time. Market Section Display - Activate/Deactivate. Time Color - Color of time. Bid Color - Color of bid price. Ask Color - Color of ask price. Spread Color - Color of spread. Higher Price Color - Color of high day price. Lower Price Color - Color of low day price. Swap Long Color - Color of swap of the buy order. Swap Short Color - Colors of swap of the sell order. Data X Distance - Distance from right to left for data. Account Section Display - Activate/Deactivate. Leverage Color - Color of leverage. Margin Color - Color of margin. Equity Color - Color of equity. Profit Color - Color of profit. Balance Color - Color of account balance. The new update looks very good. Waiting for it. 5 stars for the effort and listening to the comments. 1. Updated the product logo. 1. 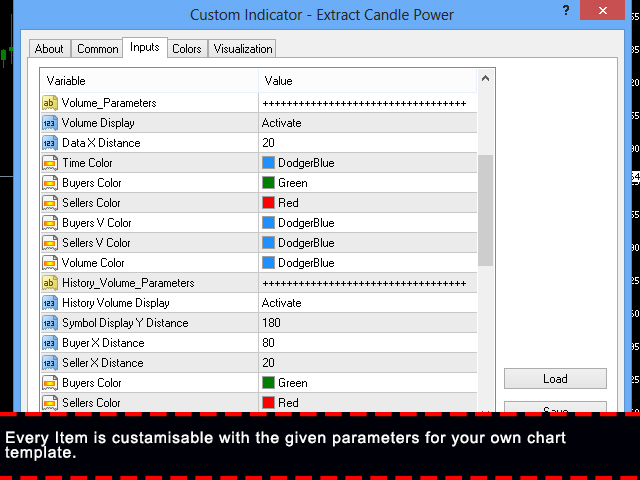 Use separate indicator window. 2. Added maximum history data. 3. Fixed few bugs that related to double numbers. 4. Added new section (Sessions Section). 2. Add more historical data. 3. Display Swap of the buy and sell orders. 4. Display account information of Leverage, Margin, Equity, Profit and Balance. 5. Activate/ Deactivate function for each information panel.